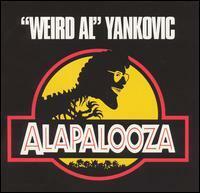 Alapalooza is the eighth studio album by "Weird Al" Yankovic, released in 1993. The cover sleeve is a spoof on the movie poster of the hit movie Jurassic Park. The name is a parody of the music festival Lollapalooza. Released after the successful album Off the Deep End, Alapalooza was met with mixed reviews, although it later was certified Gold by the RIAA. The album's first single, "Jurassic Park," was nominated for a Grammy Award for Grammy Award for Best Music Video, Short Form in 1994. After his successful album Off the Deep End, Yankovic decided to return to the studio in 1992. The main reason why he decided to record a new album so close to the release of another album, was due to the state of the as-of-then unreleased track "Waffle King" (which technically had been released on the "Smells Like Nirvana" single). This time, instead of doing one of his traditional polka medleys, Yankovic decided to do a single song polka which was composed completely of "Bohemian Rhapsody" (This was most likely done due to the song's increased popularity after the hit movie "Wayne's World" re-energized its playing on the radio. Others have speculated that it was done as a tribute to the then recently deceased Freddie Mercury). Due to the similar cover art of the two albums, some of the covers of "Alapalooza" feature the words "No, this is NOT the Jurassic Park soundtrack!" Later copies of Bad Hair Day accidentally use the CD art from this album.